A.E. 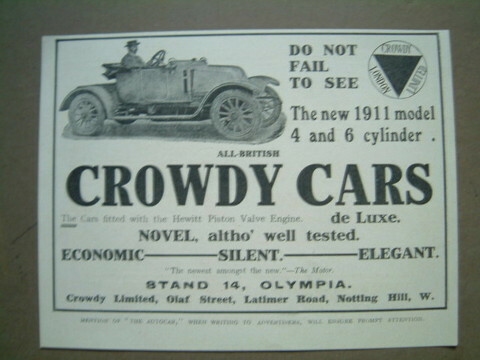 Crowdy had been Wolseley’s sales manager for Lancashire and in October 1909 he acquired the assets of the Weigel Motor Co., whose premises were in North Kensington. He showed three cars at the Olympia Show a month after his purchase. These were two conventional cars and the third with a 12/14hp Hewitt piston-valve engine. Crowdy offered a three year guarantee and availability of parts for five years, sadly the company did not last that long. The company went into receivership in February 1912. The new owners used Cowdy Ltd to take over a private venture which used the name Hampton Engineering Co.